Product prices and availability are accurate as of 2019-04-21 17:35:06 EDT and are subject to change. Any price and availability information displayed on http://www.amazon.com/ at the time of purchase will apply to the purchase of this product. Orien 15-Inch 3.2 Cu. Ft. 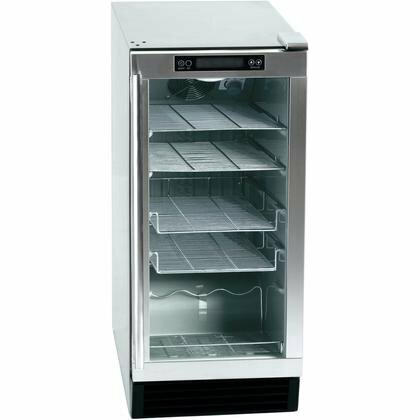 Outdoor Rated Beverage Center - Stainless Steel - FSB-15OD. FSB-15OD. Outdoor Compact Refrigerators. Orien has the answer to all your outdoor cold storage needs. The FSB-15OD beverage center is constructed of 304 stainless steel and has a fully enclosed back to keep out rain and pests. This unit can withstand outside temperatures between 25 and 100 degrees and has extra condenser lines as well as a built-in heater to handle fluctuating ambient temperatures. This beverage refrigerator features an automatic defrost system, built-in light for better visibility of the interior contents, and LED controls on the door with temperature read out. Setting memory on the control panel allows this unit to automatically return to the previous temperature settings when power is returned after an outage. This beverage center has a paned glass door with UV tinting block out harmful sunlight. The interior has 4 adjustable chrome-plated flat wire shelves and an inclined rack that can hold 5 standard wine bottles. This unit is UL listed for outdoor use, and comes with four casters and four leveling legs allowing it to be used built-in or freestanding.